An icon of the Soviet victory in the Second World War, the T-34 was involved in many global conflicts throughout the last century and can still be found in arsenals in Vietnam, Guinea, Yemen, North Korea and Cuba. When Soviet T-34s rolled into Berlin in 1945, the battle tank’s fighting days might have seemed nearly over. But the "nut", as crews called it because of its hexagonal turret shape, was only just beginning its odyssey through the world’s conflicts. Over five more decades, the war machine would clatter across the Egyptian sands, the Cuban jungle, the savannah of Angola and far beyond. Today it can still be found in arsenals in Bosnia and Herzegovina, Vietnam, Guinea, Guinea-Bissau, Yemen, North Korea, the Republic of Congo, Cuba, Laos, Mali and Namibia. Having fought against the United States and its allies in Korea and Cuba, the T-34’s American lineage is, however, less well known. The tank evolved from the light Soviet BT (bystrokhodny tank/high-speed tank) of the 1930s, which had been derived from the American M1931 Christie tank. First brought to the Soviet Union as a turret-less example under the designation of “farm tractor”, the Christie and subsequent Spanish variants provided a basis for Soviet designer Mikhail Koshkin. In the years before WWII, Koshkin worked intensively on the T-34, combining robust armor and heavy firepower while preserving road performance and ease of maintenance and production. The maiden batch of tanks was due to be reviewed by Joseph Stalin in Moscow on 17 March, 1940 after driving 1,250 miles to the capital. It was a risky decision by Koshkin to take the tanks through public land, since the NKVD secret police could have deemed this revealing state secrets. But the tanks arrived on schedule and without major incident, having driven on a secret route through snowbound forests, fields and rough terrain. Impressed by what he saw, Stalin affectionately dubbed the tank “little swallow”, and its start in life was assured. This triumph was marred, however, by the death of 42-year-old Koshkin, who had caught pneumonia during the arduous drive to Moscow and did not recover. The tank’s “adoptive father” was engineer and tank designer Alexander Morozov. He was the man who finally sent the T-34 into combat, and then adapted it to take on new and increasingly formidable German opponents on the battlefield. In December 1943, the T-34-85 rumbled into action with a new turret and 85 mm gun, which saw it though to victory in 1945. The T-34-85 remained the backbone of the Soviet tank forces until the mid-50s, and also served as a training platform for crews until the 1970s, never being formally decommissioned from service. Its largest post-WWII deployment was in Korea, when the tank came up against the USSR’s former American allies. Since Korea’s mountainous landscape precluded mass tank battles, they were used in small groups, often with unpredictable results. The first fight between the T-34-85 and the American M24 tank took place on July 10, 1950 during the Battle of Taejon. 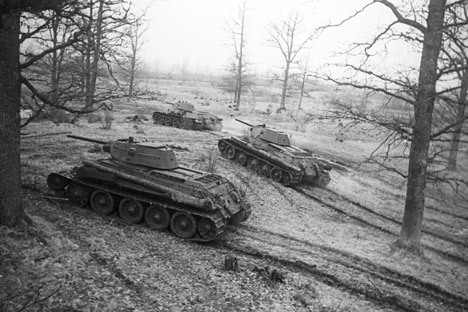 The U.S. 75 mm shells proved ineffective against the Soviet front armour and two U.S. tanks were quickly knocked out. The encounter only turned against the North Koreans after US infantry used 3.5-inch bazookas to destroy seven T-34s. The tide swung still further with the deployment of the U.S. M26 Pershing on 17 August, 1950, when the Pershing’s 90 mm cannon quickly dispatched three T-34s in this first clash of the battle tanks. With technical parity, the better trained and tactically prepared U.S. crews quickly bettered the North Koreans, who by the end of the year had lost almost 100 T-34-85s in tank-on-tank fighting, and twice as many to aircraft and bazooka hits. Meanwhile, the North Korean tanks destroyed only 34 U.S. vehicles. While the T-34-85 had met its match in the US Pershing and M46 Patton, it still surpassed the M24 Chaffee, a derivative of the M4A3E8 Sherman that carried better armament. The Soviet-built tank made the headlines again in April 1961 during the defeat of Cuban counter-revolutionary forces at the Bay of Pigs. Armed with ten Shermans and 20 M8 armored cars, the US-backed invasion forces knocked out one Cuban government T-34 as they briefly broke out of their beachhead. Personally commanding the Cuban forces, Fidel Castro rode on the first of a column of T-34s which knocked out two Shermans during the counter-attack on the landing area. Isolated victories aside, the T-34 was increasingly showing its age against the next generations of battle tanks. During the 1967 Six-Day War, Egypt lost 251 T-34-85s, almost a third of its overall tank losses. Ironically, the T-34 also fought alongside its old WWII German foes, the PzKpfw.IV and the StuG.III, in the Syrian forces engaged in the conflict. If the Israeli tanks won a clear victory on the Egyptian front of the war, the loss ratio on the Syrian front favoured the Arabs, who lost a total of 73 T-34-85, T-54 and PzKpfw.lV tanks against 160 destroyed Israeli tanks. This was the last war in the Middle East where the T-34 fought as a battle tank. But it still saw action in later conflicts as immobile firing emplacements or converted into self-propelled guns. The tank next saw major action again during the 1974 Turkish invasion of Cyprus, when 32 Greek T-34-85s were able to halt the advance of 200 Turkish M47/48 Patton tanks. The Greeks lost 12 tanks, including four that were abandoned, against 19 Pattons destroyed. The T-34 then fought in the Angolan civil war, where Cuban units armed with the Soviet tank helped repel attackers from South Africa and Zaire. Finally, the stalwart fighting machine made its mark in the ensuing civil war in the Balkans, fighting on all sides as a legacy item of the Yugoslavian armed forces. Today, when the T-34 would at last seem to have been consigned to museums and history books, it still does not rest easily. The T-34 reportedly saw action in 2014 too, when pro-Russia fighters in eastern Ukraine removed at least one display example from its pedestal, and after a quick overhaul took it into combat once more.